Not every day in my short but happy life I am able to say something like this. If you’ve been reading my blog you probably know I’m a big fan of great WordPress themes and design. I’ve been trying different services including StudioPress, Elegant Themes, WPZoom and others, and I can only endorse those which really offer something valuable and different for me and my audience. If you’re interested in an Squarespace vs WordPress comparison I’ve written that too. Ladies and gentlemen, let me present you my Squarespace review. Update: Squarespace now supports e-Commerce. Great Addition! The Apple of the Theme industry? What makes Apple an important icon for the tech industry today? Is it because of the great products? Well, perhaps. Is it because of the tech support and customer service? Yes, it’s also about it. Is it because of the great Marketing and Design? A little bit too. Is it because it offers the best products? Not really. This depends on your needs and your profile. So, what’s the biggest thing big enterprises like Apple and Google are offering today? That is integration, my lovely readers. That’s aside from the common and very important researches and investigations about your niche and the content you’re looking forward to produce. And you’ve not even started to produce content yet! Now imagine you can do all of the above in the same page including customisation for your blog’s design, all for $8 a month. Well, that would be Squarespace. 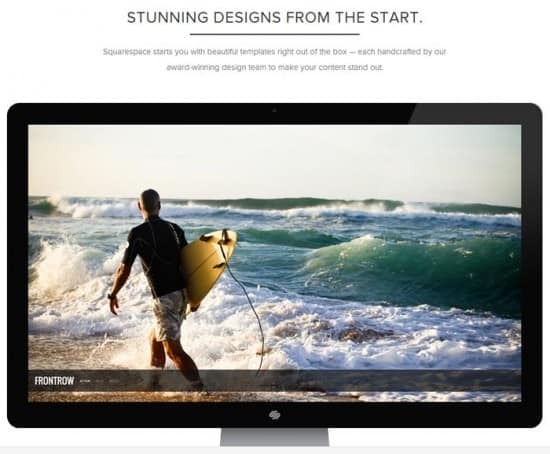 Squarespace is a company created by Anthony Casalena back on 2004. Squarespace aims users with low to 0 level skills of HTML and coding, and makes everything simple to start a website or a blog. But even better, Squarespace takes this idea and integrates everything you need to start as soon as possible all in one CMS page. So, you get your domain, your theme and your host service all in the same pay check and finally you can focus on creating great content. Compared to WordPress, where you need to find 1-5 themes that really fit your blog from a sea of endless premium and free themes, Squarespace offers you a relatively small quantity of themes, all of which you’ll end loving because the design is just stunning. When I compared Squarespace with Apple at the beginning of this review I wasn’t joking. Squarespace has some of the best Themes I’ve seen out there, and 90% of them are simple and elegant. That’s it. 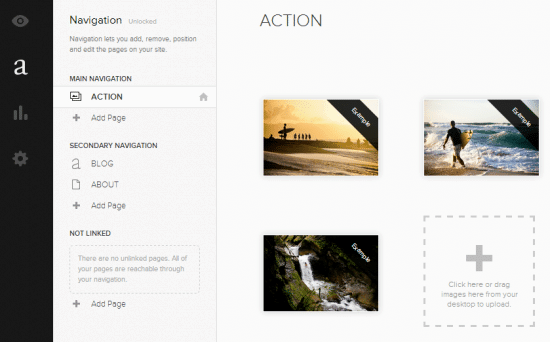 Squarespace allows you to create galleries, pages, posts and blogs within a click of your hand. The idea is to simplify any tech savvy process and focus on your needs, instead of fighting against your computer skills and messing up with the code. of course, there’s a downside between all this, but for many people it just works. Galleries are just something you’ll love to work with Squarespace 6. A superb addition of Squarespace allows you to create and manage galleries in a way you’ve never seen before. Instead of looking for 1 (or perhaps 15) plugins to manage galleries on WordPress, you have everything you need right on your dashboard. And the good thing is that all of your images are resized and submitted into different formats to make them available in different devices without eating your bandwidth. So, if you’re visiting your blog from your iPhone the image won’t consume more than 10KB (example) but if you’re in front of your computer it will take 50KB. This is especially good if your readers are visiting your blog from any mobile device. Instead of messing up with jetpack, you have the analytics feature included right into your dashboard with Squarespace. Additionally, you can link your Google Analytics account and get the report in an stunning UI. 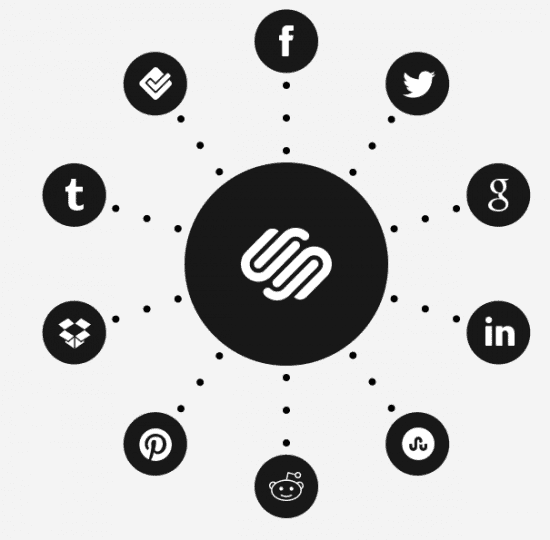 You’ll get traffic sources, referrals, search queries, popular content and more right into the Squarespace dashboard. Of course, Social Media couldn’t be out of the game, so you’ve got Social integration with the biggest Social networks including Pinterest, Tumbler, Twitter, Facebook and more. This isn’t a surprise at all. If you’re worried about not being able to control your in page SEO settings within Squarespace, fear no more. 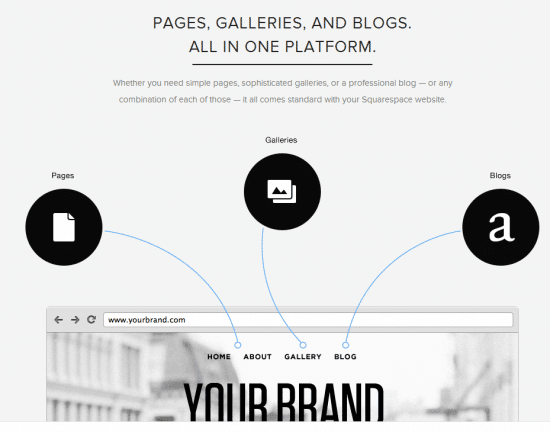 Squarespace comes with a lot of option configured so you can focus on your content. 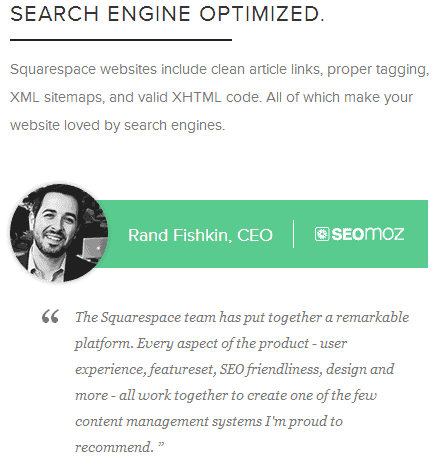 Even Rand Fishkin from SEO Moz recommends it because of its “SEO friendliness“. 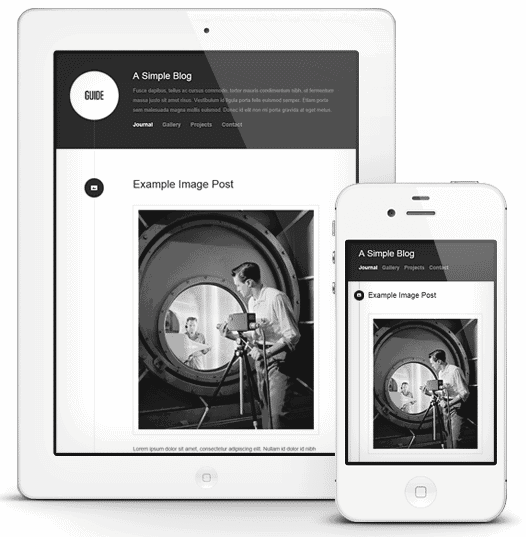 One of the biggest movements you need to consider for 2013 is Mobile Responsive websites. With more and more people jumping into the tablet / Smartphone wagon, the number of visitors reading our blogs on mobile devices is increasing very fast. All the themes on Squarespace are mobile responsive, and they combine the technology of their images to serve the best user experience. 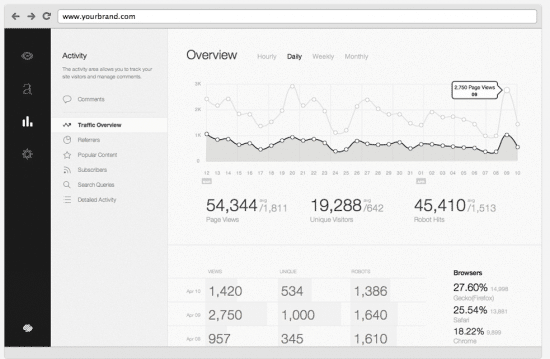 Finally, here’s a snapshot of the Squarespace dashboard to create and manage a blog. Everything you need is there already. I’ve already created an account with them and started using it for one of my blogs (which I’ll reveal on 2013). I can tell you that it’s really a pleasure to work with such a nice interface and tech support team. This is the 64,000 question of the day. And the answer is simple: YES and NO. Well, if you’re looking for an interface that allows you to create everything from scratch in a very easy way, without actually messing with code, HTML, CSS, Plugins and that stuff, then Squarespace is for you. I kind of see Squarespace as the iOS vs Android comparison. 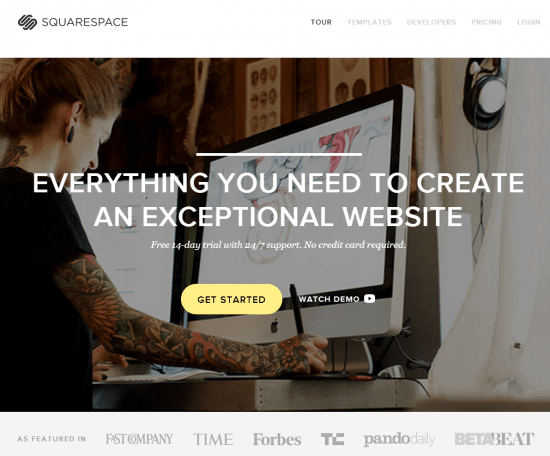 If you want something easy, powerful and elegant, you can’t go wrong with Squarespace. Also remember you’ll need to pay a monthly fee (which I think it’s a fair amount) to maintain your service. But this includes the hosting and domain name. And the Host is good enough to support and drive tons of traffic in a few minutes (something you normally don’t get with shared hosting plans). If you’re a Tech savvy person willing to learn some code basics and HTML, and you want to have full customisation for your blog including plugins, themes, hosting, domain and everything, you might be better off with WordPress. This is why I compare Android to WordPress. It’s your call, and it’s a tough one. you really can’t go wrong with both options, but it really depends on how far you want to go with your tech skills. At the moment I’m using both platforms and testing it for you. I’m a tech savvy person and I’m loving both styles, but I’ll definitely move to Squarespace if they really have all I need so I can focus on content production (Content is King, remember?) instead of “losing” my time with design, code and plugins. Go ahead and give it a test. They have a 14 day trial (no credit card required) so that you can create and setup a website and design and finally decide of Squarespace is for you. This included tech support and full access to their themes. If you don’t feel satisfied at the end, just drop it. But believe me, it’s a hard decision. You can actually extend your free trial a few times so you can get up to 1 month. This will give you 10% in advance and if you pay for 12 months you get 20% (plus 10% with the code) and 25% if you pay for 2 years in advance (35% total with the discount). Meanwhile, let me know what do you think about it on the comments below! I like the articles on your website. first thing which i saw is the alignment is not in justify mode which i feel would make the blog look more professional. second thing what i wanted to ask is i am a newbie blogger trying out different things from last year or so. is there any article of yours where you have concentrated on how a newbie blogger should proceed? i mean i have an idea, now what do i do with it? what is the structured way of proceeding. should i concentrate on choosing a website name, if yes then how? sorry if you have already written such an article and i have missed it. would be great if you can post the link here. I HAVE CREATED NUMBER OF WEBSITES AND FAILED MONETIZING, SO I AM STILL RESEARCHING. RECENTLY WHEN I FAILED LAUNCHING ANOTHER WEBSITE, I ACTUALLY CAME UP WITH A STRUCTURED WAY OF LAUNCHING AN AFFILIATION SITE. I AM YET TO LAUNCH IT. IF IT SUCCEEDS, THEN I WILL WRITE A DETAILED WRITE-UP ON IT AND SEND YOU. if you like then you can put it up here. Further to this. if written directly in comment section then the content comes in small caps. if copied and pasted, it comes in large caps. I just to justify all text in my websites a few years ago but then i learned it doesn’t mean much and it’s something old that isn’t necessary. Thanks for your suggestion however. I don’t think I have many articles about that but if you check my oldest posts you will find a few things to consider and step by step on how to setup a few things man. Hi, please can i use wordpress.org for a music download site? If yes, Is it a good idea? Thanks. I don’t think it is a good idea. Use your own domain with WordPress.com instead. hi. nice article. in the last month i was stuck in choosing one of these site builders. i’ve done a lot of search on squarespace, weekly, six, wordpress and so on. your article was nice and pointed out some nice aspects of comparison between these two site builders. and i’m agree with you too that these two look like iOS and android. i think i will choose squarespace too. i don’t want to get stuck on some coding and plugging. Yes. Glad this helped you. I had a Galaxy s4 last year and never had problems with Squarespace, although I always used chrome because the default browser is really bad. I don’t have a Galaxy now, but does it happen in other phones without chrome, or just a Galaxy line? I’m using Viewbook right now and they’re coming up with V3, an easy interface for customizing your website, pretty much like what Squarespace offers. Viewbook doesn’t offer you a package including a domain name, which is a bummer, but it does enable you to have several websites on one single account, which are not going to be visible on searches but can be accessed by giving people the URLs or linking the said websites to your main website (e.g. main website: alextrump.viewbook.com, website 2 : alextrump.viewbook.com/colorwork, website 3: alextrump.viewbook.com/travel. Squarespace says they only offer one website per account. Do they mean they offer one website period, or can you actually have several websites in the same way as Viewbook (i.e. they wouldn’t show up on searches, but can be linked to you main website, and can be accessed directly via their URL). Thanks. Hi nice article. I have been trying all the usual ones from moonfruit to Weebly, settled on Godaddy because it gave me email/website creation all in one but now changing. Started to build new site on SS because it does provide some very nice integration and the sites and templates look great. However I would say it is buggy and not intuitive at times. (wont list them here!). Its also the only one I can find that allows a Parallax scrolling (Im a slave to fashion, but not sure if I’m behind or in-front of it?). I like SS up to a point, it tends to place you in a little box (as the name suggests!) you cant get out of unless you do know some CSS. So you need to try a few and weigh up the pro’s and con’s. Im going to persevere with it but there are somethings that are so simple done on other products, yet missing from SS. If you have problems with customization and design, I probably know of 1-2 SS designers so you can get in contact with them. Thanks! you solved my dilemma 🙂 I can’t hire a web designer due to the cost so I started to learn CSS and HTML hahaha but I dont have to do that now because of SS! I’m currently trying the trial version for Squarespace because I need an e-commerce site for my clothing brand. 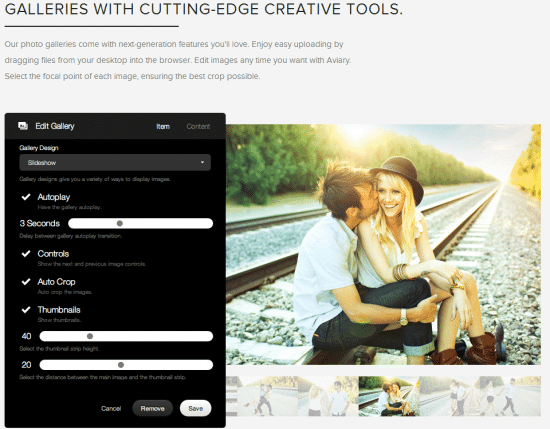 I got to say, SS has a platform that’s quite user friendly and I love the modern templates! One thing I am still deciding if I should choose Squarespace is if the e-commerce functionality powerful enough? I know you’re comparing SS with WP in this blogpost but how would you compare SS with Shopify? Shopify is a great option for ecommerce. If your ecommerce site based on the USA? Because I think that’s where SS works well. Make sure you check all the ecommerce options before anything else. Squarespace doesn’t use Plugins. It has everything integrated already. The options are definitely not as complete as Yoast’s plugin, however, you have everything to do on-page SEO right. You can set your permalinks, categories and meta descriptions/tags with Squarespace. And yes, you get your own domain (without the .sqauarespace.com) when you start paying, but the free trial is installed on a .squarespace.com domain, similar to what wordpress.com and blogger does. On page SEO is not as important as external SEO anyways. And I bet Squarespace’s servers are faster than many of those cheap hosting solutions, which helps with traffic too, but don’t expect wonders because SEO is 80% mabout external backlinks, traffic and signals. Not about on-page SEO (permalinks, metas, keywords, etc.). I really like your review. Your point of view is really interesting and the review is really clear. I want to present to you Pikock, the reliable way to build website. We focus on the ease of use of course but also on the reliability. We fix some rules to guide you so you will always have a professional look website and well optimized website for Search Engines. Professional and ready-to-go responsive themes, multi-device live preview, drag and drop builder and everything you need to get a personal or business-oriented website up and running online. I would love to have your feedback or review as an expert. Thanks for your time and I am looking forward to hearing from you. It sounds like a very interesting alternative. Are you using wordpress for this blog? I came to this post late enough that i have just finished to launch my website with all the wordpress stuff. I have a Squarespace account. Been using it for a few months. Lately I also started using wordpress for my blogs. Since I am not tech savvy and learn through trial and error as I use, my pages are very simple. Just type and post kind, plain Jane style. Don’t even have color text. But I do have a question. If I post my news articles taken from newspapers online onto my wordpress site and then post same news articles on Google+ blog and also on my 3 other SS websites, all having same news content, do I run foul of Google since G dislike duplication? Yes, Google will find it’s duplicated content and sooner or later you’ll be penalized. It’s better just to concentrate all of it in your best website! You cna publish it in Google+ too, it won’t matter. The design is definitely very professional. But is it easy to customize and make your own. I don’t think any business would want a site design that looks like someone else. Anyhow, as always, this is a very indepth review from you. I just saw that you did a case study on this article for SEO purpose. I commented on that as well. Good Job and keep up the great work. Yeah, it allows customization so that only a person who really knows Squarespace can really detect what template you’re using. I guess it’s the same problem for people using WordPress or anything else. Even if you customize it, many websites will look similar when using free or premium templates. Thanks. I noticed this post is from April. So, what made you stick with WordPress instead of moving to Squarespace? I’m currently testing it, and it’s great. I’m doubt because I’m a design addict and love changing things around often (and deep into coding). My only problem with Squarespace is that I’d need an eCommerce account and at $24/mo, that’s a bit too much for me (when I can get 3 years WP hosting for half price, almost). I also use Genesis and I’m loving the 2.0… so might stick to it. Hello Kelly. Last update was in April, yes. Not many things have changed in Squarespace lately. They added a few new themes but that’s it, so the review is still pretty much updated. Just to let you know, I’m not 100% with WordPress. I also have one page with Squarespace. but I like to mix and try things. Still, if you’re a design addict and coder, WordPress is the way to go. Better go and get some Ecommerce templates instead of going with Squarespace. I love Genesis too and I’m using 2.0.1 but they don’t have anything for eCommerce as fas as I remember. Well, I always backup my blog every time there’s a new post, and limit the attempts of login or block IPs from time to time. But not really an issue. Great post and I like your analogy to apple. Squarespace is a very what you see is what you get service and like apple it does so much for you, you may not need to customize and get all of the flexibility that wordpress offers. Gah, I can go in circles. What do you think? I think the best way to clear your thoughts here is to try the 14 days free trial and check for yourself. There’s no better way than trying the service. I mentioned about content heavy sites (for example, news) because Squarespace looks more like for portfolios and landing pages, but of course you can do a Magazine or news site without problems as with WordPress. What I’m sure about, is that your site already looks really cool with WordPress, so Squarespace will probably help you more to take care of all things from one account so you can focus on more content. Also, if you’re more like iOS instead of Android, Squarespace comes with 3 apps for iOS that allow you to take care of it on the road (not that you can’t do it with wordpress). Why don’t you try the following? 2. Create an Squarespace trial account and import the posts you exported before (don’t worry, Squarespace won’t do any Free trial account public, so it will be only available for you. Google won’t detect any duplicated content).